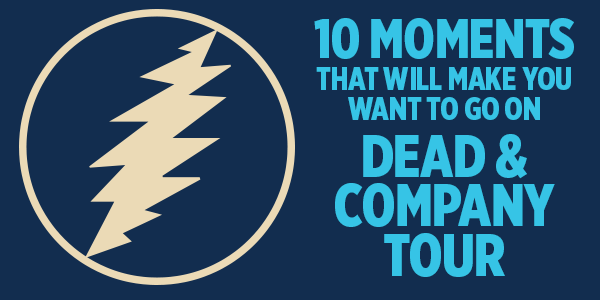 Dead & Company’s 2017 Fall Tour has finally kicked off and it’s already given us some incredibly memorable moments! From New York to Boston, the boys have been keeping the spirit of the Grateful Dead alive while ensuring that the music never stops. If you’re not on the bus yet, it’s time to hop on as Dead & Co brings their blend of free-wheeling energy across the country. the non-partisan organization, Headcount. During the tour, fans aren’t missing their chance to do their part and visit the Headcount booth. These guys are so inspiring and we’re proud we get to call them family. started with a solid “Shakedown Street” which was followed by the highlight for many, their first ever rendition of the 1981 track, “Greatest Story Ever Told.” Weir’s voice beautifully captured Robert Hunter’s words and the band accompanied with a clean performance. 4. Werewolves of New York! On the first night of the tour, the crowd was treated to a surprising cover of the Warren Zevon classic, “Werewolves Of London.” Not having played the song since 2015, John Mayer and Bob Weir traded verses on the cover that would bring the night to a close. “Werewolves of London?” Why not? Dead & Company took the opportunity to appear twice on the Late Show with Stephen Colbert. Their version of “Uncle John’s Band” was saved for Friday night’s episode, which aired while the band was simultaneously playing onstage in Boston (giving the illusion they were in both New York and Boston). Dead & Co got a chance to show off their more intimate, structured side. When it comes to keeping fans on their toes, these guys do it best. On their second night of Madison Square Garden, as the first set came to a close, Dead & Co surprised their audience yet again with their second-ever performance of one of Bob Weir’s staples from the early 80s into the mid 90s, “Man Smart, Woman Smarter”. They each brought their own style to come together and create a powerful rendition of the song. During their night at Philadelphia’s Wells Fargo Center, Dead & Company included a tribute to The Beatles with a special rendition of “Dear Prudence.” It’s moments like these that are meant to be cherished. This past Friday, Dead & Co kicked off their two-night stay at the TD Garden in Boston with a high-energy performance that included a setlist packed with fan favorites. During the second set the band catered to jazz heads when they covered Miles Davis’ “Milestones,” a song that Jerry Garcia and David Grisman once included on their acoustic jazz album in 1998. On their second and final night in Boston on Sunday, Dead & Co debuted their version of the Robert Hunter penned, “Corrina” during the first set. The song was played amongst mainstays like “Dire Wolf,” and “Loser,” and showed how this ever-evolving band is always looking to challenge itself. Nothing says “be yourself” like the music and fans of the Grateful Dead. The people watching is so good, in fact, GQ Magazine took notice. Hilarious, right? Let’s just say that Deadheads can be highly entertaining.